happy blend of the seaside, relaxation and leisure activity. Set on one of the most beautiful stretches of the Salento shore, Nicolaus Club Il Gabbiano stands directly on the seashore just a short distance from the gleaming beach of Marina di Pulsano. 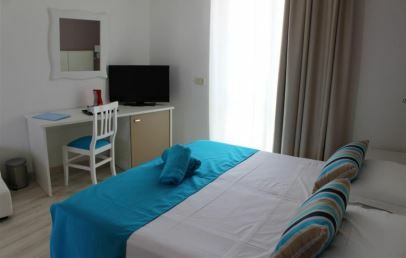 The hotel is 75 km from Brindisi Airport and is a great base for visiting the Salento and the whole region. Marked by a fresh elegant style, Nicolaus Club Il Gabbiano is set out in two wings surrounded by well-arranged common areas which host the pool with solarium and relaxation area and a large terrace for theme evenings. The hotel’s 90 rooms are warm and welcoming, marked by simple modern furnishings. 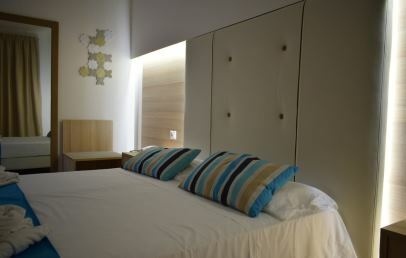 All rooms, recently refurbished, have AC, phone, safe, Led TV, minibar, en-suite with shower and hair dryer. Guests can book a large Family Floor consisting of three rooms each with bathroom and a small closet, ideal for family groups up to 6/10 people. A fine white sand beach is right in front of the hotel (about 100 meters away), and can be reached by an underpass running directly from the hotel itself. The great attraction of this locality, known as “La Fontana”, is the presence of an underground spring which comes to the surface on the beach, so that bathers can enjoy the invigorating sensation of fresh water. At the private Lido, hotel guests will find sun loungers, sun umbrellas, showers and a bar (bar service requires payment). Guests with limited mobility can use the Job chair to make it easier to enter the sea. The first set of beach towels is free, changes require payment. The qualified staff of the Nicolino Club offers a rich and varied programme of activities and entertainment, divided by age groups: the Nicolino Baby Club (3/5,99 years) and the Nicolino Mini Club (6/12 years), with sports, fun learning, recreation and preparation of shows at the amphitheatre. The structure has a pool reserved for kids, a combined tennis/basketball court, a 5-a-side synthetic soccer pitch and an area of the Nicolino Club is set up as a playground. Guests can request a baby buggy for kids aged 0 – 3 years, subject to availability. Nicolino Card mandatory (0-2,99 years old): Mum's Corner (in high season) at the restaurant, baby food kit; bottle warmer in the room and, if requested, baby bathtub. Breakfast is continental style, lunch and dinner served from the buffet in the three air-conditioned restaurant rooms. During the week, one typical dinner and one smart dinner are held. From 10:00 to 11:00, light breakfast for late risers served at the bar with espresso coffee, fruit juice and pastries. For special dietary requirements (gluten/lactose intolerance) basic packaged products are available, which may be supplemented with products provided by guests. Please state requirements when booking. For the use of parents with babies/toddlers there is an area equipped with bottle-warmers, microwave oven, small buffet with two types of pasta, cream of vegetable soup, tomato sauce, the chef’s soup and high chair. The Soft Inclusive formula includes: welcome cocktail with sparkling wine; full board with drinks at meals (water, wine, soft drinks and beer on tap); espresso coffee at breakfast; free drinks on tap (cola, orangeade, fruit juice) and granite, at the pool bar; Aperitime from 19:00 to 19:30 with salty snacks and the non-alcoholic house cocktail; Teatime from 17:00 to 17:30 with house pastries; gastronomy events during the day. With payment: cafe service, alcoholic drinks and liqueurs, wine list, room service for breakfast, lunch and dinner. Guests have free access to all internal and external areas of the hotel: a large lounge with seating and a reading area, three bars (at the pool, in the hall and on the beach), three restaurants with AC, a wellness area, garden with two pools (one reserved for children) with solarium and relaxation area. Free Wi-Fi connection available in the hall. The following services require payment: night-time use of the soccer pitch, the covered garage (subject to availability of parking spaces), excursions and minibar items. Situated in the main wing, the Classic rooms are comfortable and functional, marked by simple modern furnishings. The Comfort rooms are welcoming and marked by simple, modern furnishings. In case of 4th bed, it will be a bunk bed. Some rooms with connecting door available. 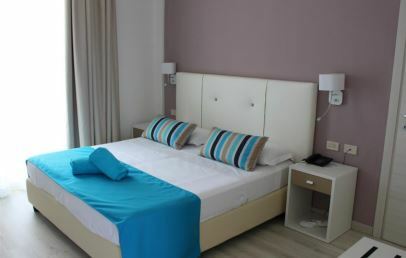 Large, completely refurbished rooms, the Deluxe have extremely stylish furnishings. In case of 4th bed, it will not be a bunk bed but a single bed. Guests of Deluxe rooms enjoy: evening cleaning, courtesy set with bathrobe and slippers, coffee maker with pods, first supply of soft drinks in the minibar, then daily supply of two small bottles of water, beach towel with daily change, reserved parking space in covered garage, possibility of choosing on arrival table service at lunch and dinner (no supplement charged). The Comfort rooms are welcoming and marked by simple, modern furnishings. In case of 4th bed, it will be a bunk bed. Furnished terrace. Baby cot for the child up to 2 years old to be requested upon reservation and to be paid locally: € 10,00 per day. Maximum 1 baby cot per room!